2015 has proved to be one of those rare years that Warren Buffett’s Berkshire Hathaway (BRK.A) has badly lagged the market. Berkshire H. finished the year 12% down. There stands the question: Is Warren Buffett losing his mojo? Efficient Market Hypothesis: Warren Buffett’s investment style has mainly focused on value picks of companies with sizable moats that makes it difficult for them to succumb to competition. But it appears as if the moats surrounding some of his companies are drying up and the walls being breached. 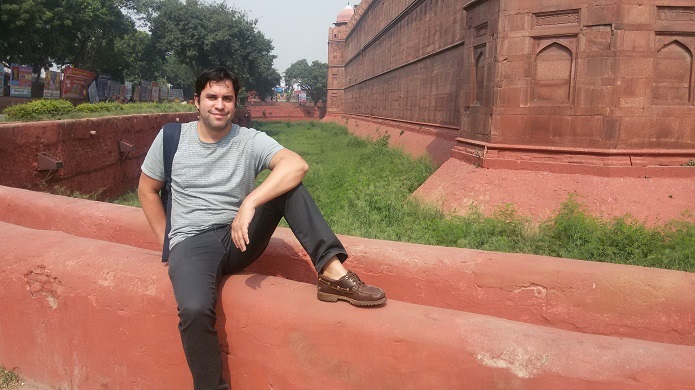 Definition: Moat is a Big Barrier, which closes out new entrants into "your" market. Moat can be built through technological advantages versus competitors, efficient delivery chains, etc. It is a well studied framework in the field of Industrial Economics (which I studied at the end of the '90s when I was attending Economics-University). The wider the moat, the larger and more sustainable the competitive advantage of a firm. By having a well-known brand name, pricing power and a large portion of market demand, a company with a wide moat possesses characteristics that act as barriers against other companies wanting to enter into the industry, see also www.investopedia.com/terms. There is another theory that can be advanced to explain why Berkshire Hathaway’s legendary run could finally be coming to an end: the Efficient Market Hypothesis, or EMH, advanced by none other than Warren Buffett’s most prominent intellectual rival, Eugene Fama. Mr. Fama won the Nobel Peace Prize in Economics in 2013 by advancing the theory that explains why trying to beat the market on a consistent basis really is a mug’s game. Fama, together with his assistant Kenneth French, used data from 1982- 2010 that showed that returns from actively managed funds such as Berkshire Hathaway had a huge 99% correlation to the market. In effect, the data suggests that active investing really is a zero-sum game where a gain somewhere is offset by an almost equal loss elsewhere before accounting for fees and expenses. Berkshire Hathaway’s poor performance in 2015 was noticeable due to the huge underperformance relative to the market. But a closer look at the performance of the company over the past three years suggests that this is something that has been going on for some time. Berkshire Hathaway has actually significantly underperformed the market over the past five years, with a return of 61.4% vs. 71.4% for the S&P 500 Growth Index (the index tracks the performance of large-cap U.S. securities with growth characteristics). Fama also found that after factoring in the fees charged by actively managed funds, only 3% outperformed their passively managed peers. When viewed over its entire lifetime, Berkshire Hathaway falls squarely in that exceptional 3% of actively managed funds that outperform the market. But over the past five years or so, the performance of the company has only been average, suggesting that it’s not entirely immune to EMH. So, has Warren Buffett and Berkshire Hathaway really lost its mojo? Maybe not but as he recently observed, the days of beating the market by 15%-20% over long stretches are over. Warren Buffett’s record post financial crisis is mixed at best. Two of his notable homeruns include the USD 750mn Goldman Sach's position that is now worth about USD 2.5bn while his Bank of America Corp position has expanded from USD 5bn to over USD 10bn. But then again his multibillion-IBM position remains firmly underwater. 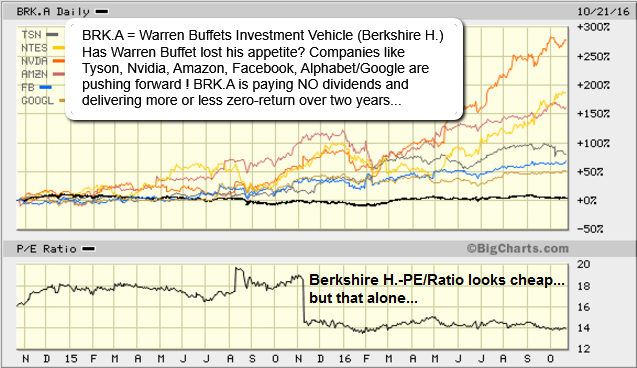 Warren Buffett considers Berkshire stock as cheap enough to buy when they hit a multiple of 1.2x book value or less. The current reading of its book value still has quite some room to run before Warren Buffett can consider buying back Berkshire stock which should add considerable shareholder value. From my own experience/Ralph Gollner (I bought my first stocks in the year 2000 - directly at the peak of the market of course - that is how you learn ;-) I can say, that investing from the year 2000 up to 2014 was pretty "straight-forward": either the markets went down for quite some time (remember that devastating years 2000, 2001 and 2002 ?...) or the market goes up for several years. And then there were really bad years in between/hard periods like in 2008 or 2011, but which were still fast come and done (NO zig-zag). Disclosure/Disclaimer: Ralph Gollner hereby discloses that he directly owns shares of some of the securities mentioned above (as per 21st October 2016): Facebook, Alphabet, Tyson, Amazon, NetEase, Nvidia. Reminder: High Beta stocks are especially risky!